Lee at Lockwood Gorge, Lebanon Twp . No one loved the outdoors more than Lee Hughes, and few found more inspiration in it. The New Jersey impressionist painter, happiest when painting en plein air, produced an enormous body of work over six decades. Lee Westlake Hughes died in Sonora, Calif., on Feb. 6, after a short illness. He was 83. He had moved west in 2002 to be near his daughter and grandchildren. Born in East Orange, Hughes served in Korea and Japan as a U.S. Navy corpsman attached to the Marines during the Korean War. When his tour of duty was over, in 1953, he devoted himself to a career as an artist. 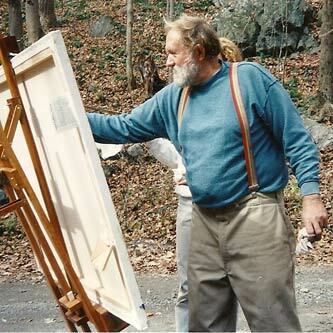 Most of his work, ranging from landscape to marine to industrial subjects, was executed outdoors in Morris and Somerset counties – primarily in the areas of Gladstone, Chester, Mendham, Brookside, Bernardsville and Califon. A noted colorist, Hughes defined his work by his exuberant brush strokes. His paintings frequently have been likened to those of the European Impressionists for their contrasts of light and shadow and bold use of color. Hughes was a model of determination in the face of difficult odds. He never allowed diabetes, heart surgery, hip replacement or his lifelong struggle with depression to interfere with his commitment to painting. Equally proficient in the mediums of oil, watercolor and acrylic, he turned out an astonishingly rich, varied and voluminous number of paintings, many of them large works. In addition to pursuing his own creative goals, Hughes loved helping aspiring artists. He taught at the Newark School of Fine Arts and at art associations in both Morris and Somerset counties. A patient and encouraging teacher, he was bent on guiding students to higher levels of success, which often involved gathering outdoors to introduce them to the challenges and joys of plein air painting. It underscores his enthusiastic approach to painting that, when weather forced him to paint indoors, he often chose to do it to rock music, like Pink Floyd. Hughes was honored with more than 200 awards during his career. His paintings have been included in more than 200 exhibitions, including one at the Smithsonian Institute in Washington, D.C. His work is represented in the collections of the Morris Museum, Seton Hall University, Delbarton School and in China's Zhejiang Museum, as well as in corporate and private collections all over the world. A major retrospective of Hughes’ paintings, including many of his large works, was held at the Somerset Art Association in 2007. 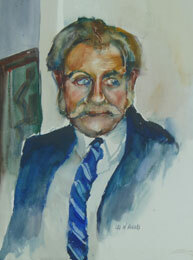 The most recent New Jersey showing of his work was in 2011 at the Morris County Library, featuring 32 of his early, never-exhibited watercolors. Hughes is survived by a daughter, Katy (Mrs. Glenn) Kelley of Sonora, Calif., a son, Lee Westlake Hughes III, of Redondo Beach, Calif., and five grandchildren. He was predeceased by his brother, Dr. Philip C. Hughes, in 2013. We are currently compiling a comprehensive database of works produced by Lee W. Hughes Jr. Contact connoisseur@cfineart.com on submitting artwork.